Hans Frei, one of the most influential American theologians of the twentieth century, is generally considered a founder of postliberal theology. Frei never set forth his thinking systematically, and he has been criticized for being inconsistent, contradictory, and insufficiently rigorous. Jason Springs seeks here to offer a reevaluation of Frei's work. Arguing that Hans Frei's theology cannot be understood without a meticulous consideration of the complex equilibrium of his theological and philosophical interests and influences, Springs vindicates Frei's Christologically motivated engagement with Ludwig Wittgenstein, Clifford Geertz, and Erich Auerbach, as well as his use of ordinary language philosophy and non-foundational philosophical insights, while illuminating his orientational indebtedness to Karl Barth's theology. Moreover, by placing Frei's work in critical conversation with developments in pragmatist thought and cultural theory since his death, this re-reading aims to resolve many of the misunderstandings that vex his theological legacy. 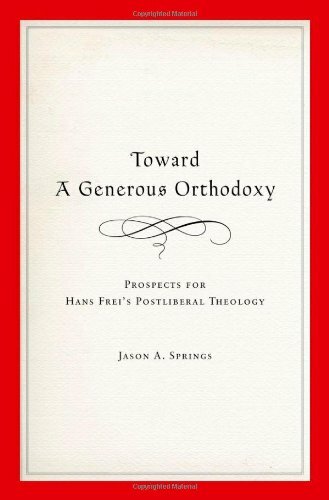 What emerges from Toward a Generous Orthodoxy is a sharpened account of the Christologically anchored, interdisciplinary, and conversational character of Frei's theology, one he came to describe as a "generous orthodoxy"-modeling a way for academic theological voices to take seriously both their vocation to the Christian church and their roles as interlocutors in academic discourse.